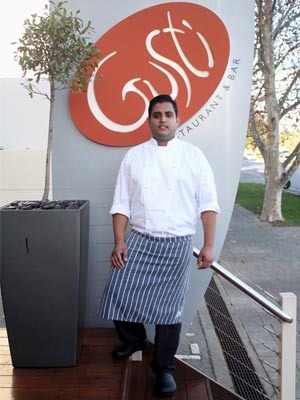 In meeting Chef Vikas Chandra of Perth’s Gusti Restaurant, one thing is obvious- he has a strong passion for fresh and innovative dishes as evident in his menu. Originating from India, Chandra came to Australia in 2009 where he began his career in Port Douglas located in Australia’s North Queensland. In 2013, he joined Perth’s Crowne Plaza and has since then, continuously delivered an inspiring array of fresh, locally sourced dishes that are sure to perk up your palate! With a background in Indian cuisine, Chandra has incorporated his heritage into a modern menu by adding his very own Indian spin to his dishes. These techniques are apparent in his signature dish; Tasmanian crispy skin salmon, which integrates curry powder and spices into the raisin and romesco coulis. With the simplicity of each dish and the rich flavour originating from locally sourced ingredients, the meals are fresh and flavoursome. Due to the location of the restaurant (within the Crowne Plaza), Gusti has adapted their menu to appeal to corporate cliental. They offer an array of healthy dishes by eliminating the use of butter and cream without comprising flavour, case in point the elusive creamy mango pudding. A number of recipes have been designed for Gusti by a panel of culinary ambassadors. The program was created through a partnership between the InterContinental Hotel Group (IHG) and a panel of celebrity chefs all of whom are identified on the Gusti menu. These include the sweet and sour pork belly with green apple, veal chop, portobello with rocket salad and mango pudding. With bean shoots, thin rice noodle salad and sweet spicy dressing with masculine, fresh chillies. With torn bocconcini, green peas, locally grown pumpkin, baby spinach, fresh chilli and parmesan flakes. Slow braised for six hours, with red wine and fresh tomatoes, tossed in pasta with baby spinach and drizzled with olive oil. This dish is perfect for winter, with a hint of lemon juice to incorporate tangy citrus into a hearty, flavoursome starter. Main: Tasmanian crispy skin salmon with warm salad of cauliflower, green beans, cherry tomato, kipfler, raisin and romesco coulis. This local dish is one of Gusti Restaurant’s best sellers, and considered Chef’s signature dish. Dessert: Banana pie with caramel, caramelised banana, roasted banana ice cream, pashmak and pecan nut. With a homemade base and churned ice-cream, this dessert is a special, sweet addition.